You wake up on your first morning in London, perhaps after a long journey, and what’s the first thing you would like to do? Sure, there’s the Tower of London to storm, Big Ben waiting for his portrait to be taken and some of the world’s finest museums to discover. But the Crown Jewels and Rosetta Stone aren’t going anywhere. We’re talking that moment when you wake up a bit groggy and still adjusting to the new time zone. What you need is some fresh air and a little sunshine! 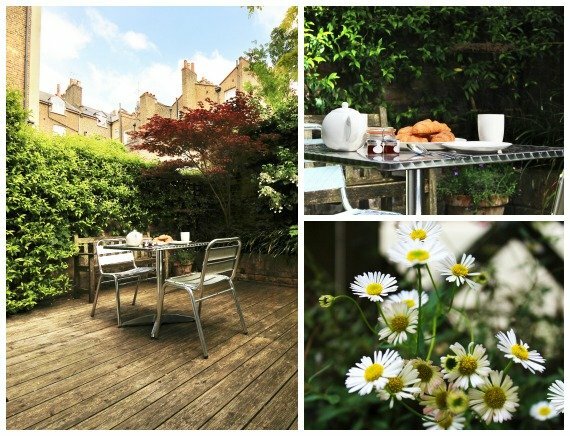 How about you get that coffee or strong cup of tea and step out onto your own private garden patio. Yes, now we’re talking! Take a deep breath, let those rays of sunshine sooth away the hours of jet lag and now you’re good to go. 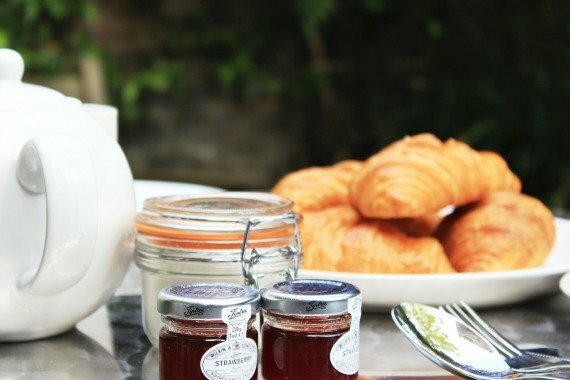 If this sounds like the perfect way to start the day in London, then you’ll want to stay at the Portland, a stylish and comfortable one bedroom vacation rental in Chelsea. 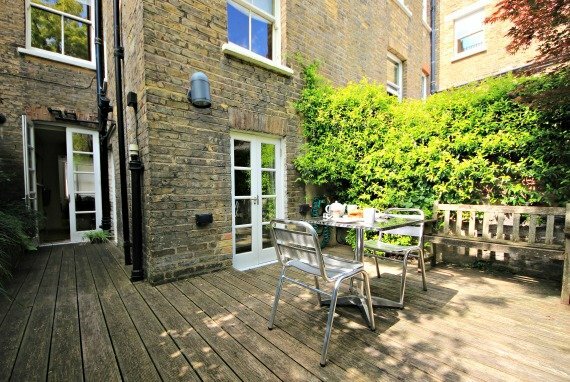 This garden level apartment is set on lovely residential street near Tedworth Square, where Mark Twain once lived. You’ll be just moments from swingin’ King’s Road with all its great shops and restaurants in one direction and the Thames embankment in the other direction. And in between? Well, that’s just one of London’s most charming neighbourhoods – Chelsea! When you return home from a day out sightseeing, shopping and exploring the best of London, you’ll love the tranquil setting of the Portland. The garden patio adds a touch of green that creates a beautiful natural backdrop while you’re relaxing in the living room or bedroom. We just love how you’re in the middle of a vibrant city but still feel the calm of nature surrounding you. You can step out to the garden patio from both the living room and the bedroom at the Portland. That sunshine first thing in the morning? Yes, that’s an easy one … just step outside! Grab your London guidebooks and map and spread them out at the table while planning your next day’s adventure or trying to remember just how many places you walked in one day. 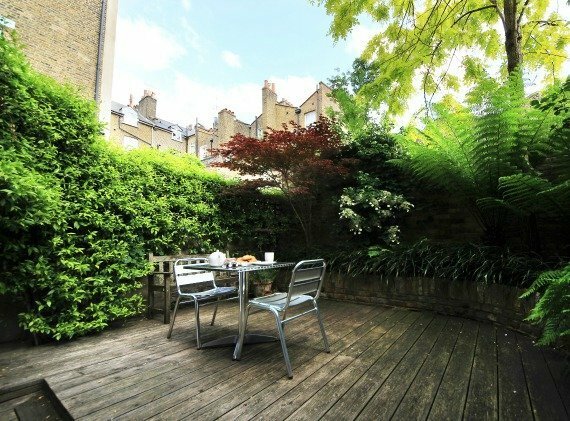 Or find a good book from one of London’s best bookstores and enjoy a relaxing moment outdoors during your stay in London. The garden patio just beckons you to dine outdoors on lovely summer evenings. Chelsea has a wonderful selection of grocery stores, gourmet take away delicatessens and bakeries to choose from during your stay. There’s even an excellent food market nearby at Duke of York Square on Saturday mornings where you’ll find British specialties, prepared foods, farm fresh cheeses and meats and tasty desserts. The garden patio at the Portland pretty much sums up what we love about vacation rentals while traveling. 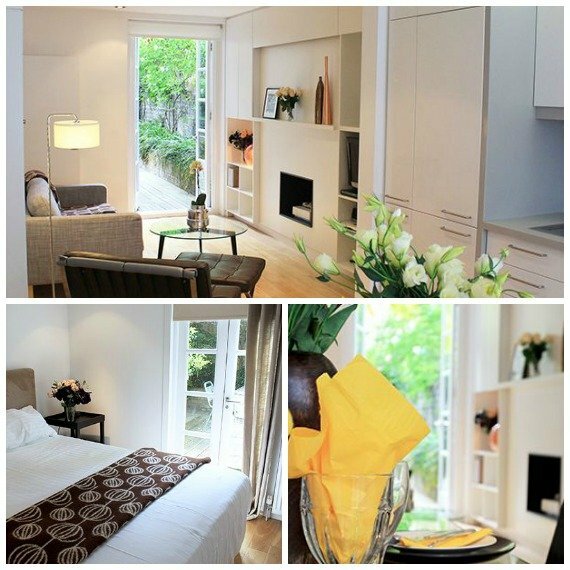 Feel at home and enjoy every moment of your stay in London! To find out more about the Portland, visit the website here or simply click on any of the photos above to be whisked right over to the apartment details online. Contact Us to book your stay and to find out about some fabulous Last Minute Sales for a summer stay at the Portland in Chelsea! 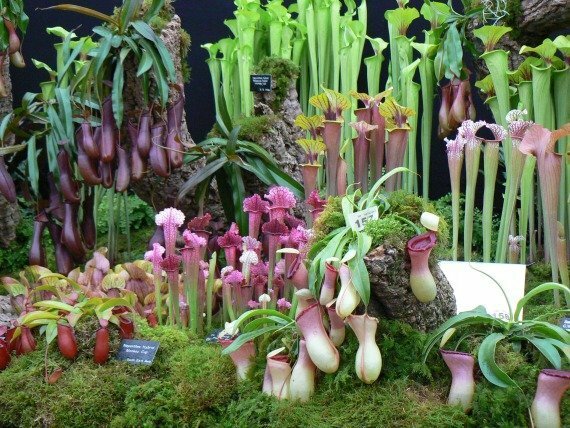 PREVIOUS: The 2014 Chelsea Flower Show Begins! Posted on Friday, May 23rd, 2014 at 11:33 am in Apartment Rentals. You can follow any responses to this entry through the RSS 2.0 feed. You can leave a response, or trackback from your own site.